Create complex WordPress queries visually. 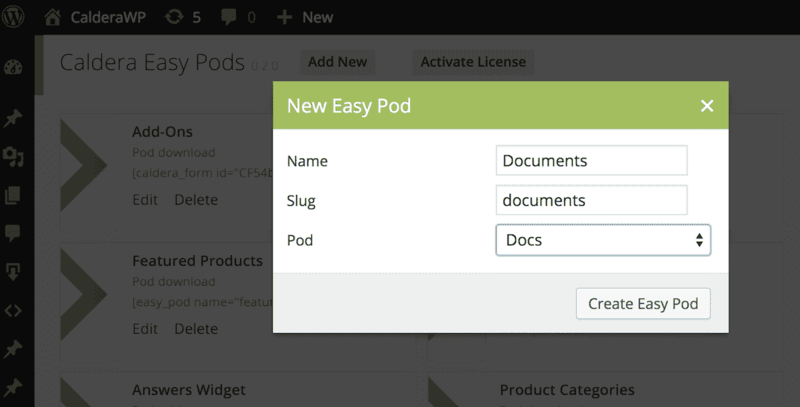 From the main Easy Pods Admin screen you can create a new Easy Pod by clicking the “Add New” button. This will open a modal. In the modal you can give the Easy Pod a name, and set its slug. The slug is how the Easy Pod will be referred to in the shortcode that you use to display it. While the slug is automatically generated from the name, you can change its value. Just make sure to use only alphanumeric characters and underscores. The third option in this modal is the Pod you want to query. If you want to query a post type that is not a Pod, including any custom post type, or any of the default post types, you can simply add them as extended post type Pods. This is what we have done on CalderaWP.com in order to create Easy Pods in the “download” custom post type added by Easy Digital Downloads. You can set a Pods Template to be used when rendering the results of your Easy Pods query from the Easy Pods Editor’s “General” tab. From this tab you can choose any of your existing Pods Templates. If you do not choose a Pods Template at this point whenever you the Easy Pod, you must provide an inline template. How to do this is covered in the document “Outputting Your Easy Pod“. For more information on creating and using Pods Templates, please see the Pods Templates Tutorials. The heart of the Caldera Easy Pods editor is the “Query Tab”. This tab provides an easy visual editor for creating simple and complex queries. For any query you can create multiple groups. When creating multiple groups WordPress will return any results that match the queries from any of the groups. Inside of groups you can add multiple lines. The conditions within a line are evaluated on an “AND” basis. That means that the conditions set by each line must match.